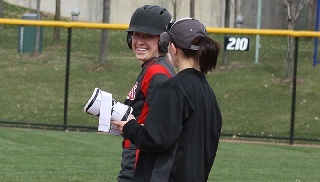 Green Bay, Wis. -- The Youngstown State softball team set a school single-game record with 20 hits en route to a 17-8 win over Green Bay in game two of a doubleheader on Saturday afternoon. The Penguins lost game one, 10-9. The Penguins improve to 23-17 overall and 10-6 in the Horizon League while Green Bay falls to 16-26 overall and 7-7 in the league. In the nightcap, the Penguins scored 14 runs in the final three innings after falling behind 8-3 after three innings. Youngstown State scored five runs in the fourth seven runs in the fifthand two more in the sixth inning to put the game away. Junior Brittney Moffatt went 4-for-5 with three runs scored and two runs batted in to lead the Penguins offensive attack while junior Sarah Dowd, senior Katie Smallcomb and junior Alexandria Gibson each drove in three runs. Smallcomb, Gibson and senior Jordan Macey each had three hits for the Penguins while Dowd and junior Maria Lacatena had two apiece. Trailing 8-3 after three innings, the Penguins used a five-run inning to knot the game at 8-8. Moffatt began the rally with a double to right-center field to score Miranda Castiglione, who walked. After a wild pitch, Lacatena singled to center field to plate Moffatt while Smallcomb doubled home Stevie Taylor, Gibson singled homw Lacatena and Macey's single to left-center field plated Smallcomb with the game-tying run. In the top of the fifth, Moffatt's single to right field plated Castiglione with the go-ahead run while Lacatena had a run-scoring double to left-center field to score Moffatt. An RBI-single by Smallcomb, a sacrifice fly by Gibson put the Penguins up 10-8 and Dowd's three-run home run gave the Penguins a 13-8 lead. The Penguins scored two more runs in the top of the sixth on a run-scoring double by Smallcomb and an RBI-single by Gibson. Green Bay jumped out to a 3-0 lead after the first inning but the Penguins tied the game after scoring two in the second and one in th top of the third. The Penguins score a pair of unearned runs in the second and Taylor led off the third with a solo home run, her first of the year, to tie the game at 3-3. Green Bay scored five runs in the bottom half of the third to take an 8-3 lead. In the first game, the Penguins trailed 4-0 after the first and 6-2 after two innings. In the top of the third, a bases-loaded walk to Taylor, who went 2-for-3 with a home run and three RBIs, and a sacrifice fly by Lacatena got the Penguins within, 6-4. Castiglione blasted a three-run home run in the top of the fourth inning to put the Penguins up 7-6. Smallcomb scored on a passed ball in the top of the fifth inning to extend the Penguins to 8-6, Phoenix knotted the game at 8-8 after five complete. Taylor's double down the left field line in the top of the sixth plated Castiglione and gave the Penguins a 9-8 lead. Green Bay scored two runs in the bottom half of the sixth to come away with the one-run victory.